Check out this innovative way to recycle bicycle inner tubes. 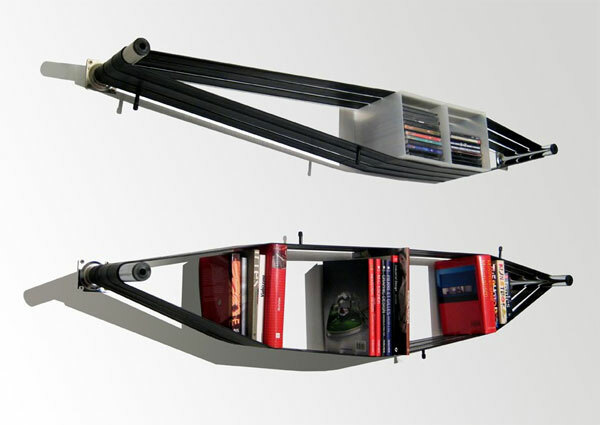 The ElasticShelf designed by SystemDesignStudio uses tension created in the tubes when they are stretched between two fixed metal bars on the wall. This tension is then used to keep your objects in place and no the shelf. Adding different objects to the shelves creates different shapes with the tubes which in themselves add a unique characteristic to the environment the shelves are positioned in. This innovative design was submitted into the inhabitat Spring Green competition which challenged designers and crafters to take pieces of junk and transform them into something cool and original.